An all-around lens ideal for creative photography and movies, Canon's EF-S 18-135mm f/3.5-5.6 IS USM adds cutting-edge technology to an extremely flexible zoom range. Delivering remarkable performance for everyday capture, it's equipped with Canon's new NANO USM technology, featuring high-speed and near-silent AF. What's more, it's also compatible with Canon's Power Zoom Adapter PZ-E1 (Sold Separately)for more natural zooming during movie capture. For landscapes, portraits, sports videos and everything in between, the EF-S 18-135mm f/3.5-5.6 IS USM provides great versatility with its magnificent optics, comprehensive zoom range and premium design. It's an impressive complement to the EOS 80D camera, or any EOS camera with an APS-C size sensor. Equipped with new NANO USM technology combining Ring USM and STM for smooth and near-silent video and high-speed AF for still capture. Fast and incredibly quiet, the EF-S 18-135mm f/3.5-5.6 IS USM's NANO USM AF system not only delivers high speed AF, but also makes quiet, fast and smooth AF transitions that can be ideal for movie recording. Combining ring USM and STM (lead-screw type) features, the diminutive chip-shaped ultrasonic motor is engineered to help deliver high-speed, smooth, precise and near-silent operation, plus full time manual focus (when using one-shot AF). Improved AF speeds up to 4.3x (Tele) and 2.5x (Wide) for faster autofocus. Thanks to its new NANO USM motor, the Canon EF-S 18-135mm f/3.5-5.6 IS USM focuses incredibly fast - a clear advantage for action photography and for working on the fly. Compared to the previous model*, it focuses approximately 4.3 times* faster at the telephoto end, and 2.5 times* faster at the wide end when using the viewfinder, for a noticeable speed advantage that can help ensure a stellar photo. * Based on Canon's standards. As compared to the EF-S 18-135mm f/3.5-5.6 IS STM. Compatible with new Power Zoom Adapter PZ-E1 (Sold Separately), providing electrical zooming that helps deliver more natural zooming while shooting video. The EF-S 18-135mm f/3.5-5.6 IS USM is compatible with Canon's Power Zoom Adapter PZ-E1 for electronically controlled zooming. This convenient accessory works with the lens to enhance an EOS camera's video capabilities by providing a smooth and near-silent powered zooming function that's an ideal complement to the lens's speedy AF. The PZ-E1 has adjustable zoom speeds, an integrated locking mechanism, offers remote controlled zooming and is designed to integrate seamlessly with the EF-S 18-135mm f/3.5-5.6 IS USM for streamlined operability. Image Stabilizer effect at up to 4** stops of shake correction helps capture sharp images. Thanks to a newly enhanced Image Stabilizer system that features a more rigid mechanical structure and the incorporation of faster algorithms, the EF-S 18-135mm f/3.5-5.6 IS USM's Image Stabilizer effect has been improved from 3.5 stops to 4* stops for better performance in even more challenging situations. Whether shooting in low light or any time a slow shutter speed is necessary, the EF-S 18-135mm f/3.5-5.6 IS USM's Image Stabilizer helps deliver stable, sharp results. Dynamic IS helps reduce camera shake when shooting video for improved image quality even when the user is in motion. When recording video, the EF-S 18-135mm f/3.5-5.6 IS USM's Dynamic IS system helps compensate for camera shake such as when handholding the camera or making movies while walking, especially when using wide focal lengths. By compensating for the camera's motion, it helps deliver sharp, accurately focused images with ease. One UD lens and one PMo aspheric lens help provide high-resolution and high-contrast images with reduced chromatic aberration throughout the zoom range. 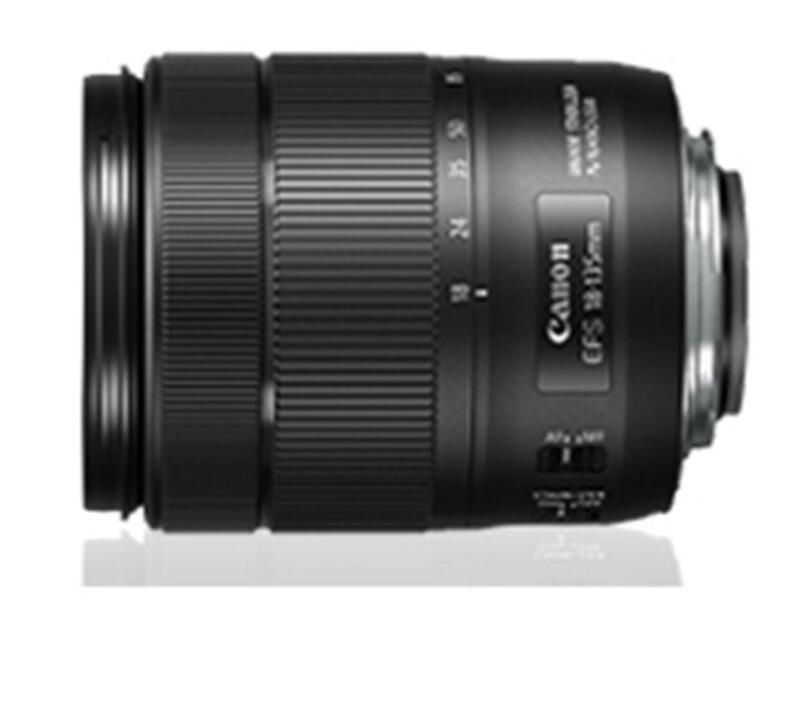 The EF-S 18-135mm f/3.5-5.6 IS USM features a number of advanced Canon optics to provide a sharp, high-resolution picture throughout its zoom range. Featuring a UD lens and a high-precision aspherical lens element, its optical formula helps reduce chromatic aberrations, flare and ghosting, reliably delivering excellent results. Premium exterior design includes a satin finish, sleek silhouette, black ring and metallic mount for high performance with a sophisticated look and feel. The EF-S 18-135mm f/3.5-5.6 IS USM features a new exterior design that gives it a feel of power and refinement. An elegant shape, comfortable zooming and focus rings as well as easy-to-read markings complement its new finish. A metallic mount and a new black ring that separates the zoom and focus rings add to the lens's feeling of quality.